Yet another University of Oregon basketball team is headed to a national championship tournament this year. The UO Unified Basketball Team, comprised of students and local Special Olympic athletes, beat the top Unified teams in the Pacific Northwest to win the NIRSA Region VI Basketball Championships at Eastern Washington University in Cheney, Washington. The Ducks’ win was a bit of an upset. After finishing 1-1 in pool play, the No. 3-seeded Ducks beat out more heavily favored squads from Spokane and host Eastern Washington to claim the regional title. 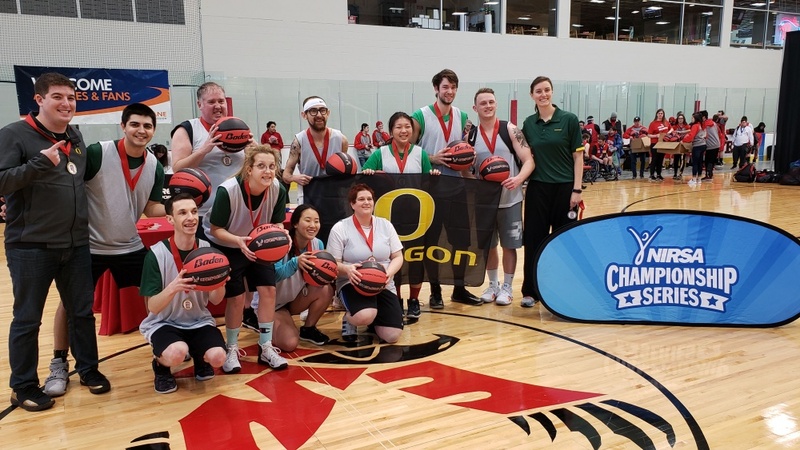 Along with the honor of being Region VI champions, the UO Unified team earned an invitation to the NIRSA National Championships in Wichita, Kansas, next month. NIRSA is a collegiate recreation association that was formerly known as the National Intramural-Recreational Sports Association. Unified Sports is a Special Olympics program to bring people all of ages, both with and without intellectual disabilities, together as teammates. The UO Department of Physical Education and Recreation’s intramural program partners with Special Olympics to run Unified Sports leagues for basketball and soccer on campus. For the UO students on the team, the regional tournament was more than a chance to represent their school and have some fun. The trip helped them form deeper relationships with people from outside the campus bubble. The tournament was a first for UO junior and team member Lauren Nguyen, who also works at the Rec Center as a personal trainer. The team’s trip was made possible in part by a Diversity Action Plan implementation grant from the Division of Equity and Inclusion, which supports annual diversity initiatives for UO campus groups. The plan to fund the team’s road to Wichita, however, is still underway. Sean Graninger, coordinator for intramural sports and youth camps, helped coach the Unified team to victory and is working with his coworkers in PE and Rec to get the team to the championships. “We may have to do some fundraising to get there, but they’ve earned their spot,” Graninger said. The team has launched a campaign through DuckFunder, the UO’s crowdfunding platform, to raise money for the trip. Gifts are tax-deductible and will help cover travel costs for team members and coaches. In addition to the team’s success on the court, another Duck made his mark on the tournament this weekend. UO student Brad Rondeau was named an all-tournament official and earned a bid to officiate at the national championships. Rondeau is the first UO student to receive an invitation to officiate at a NIRSA national championship in any sport. The NIRSA National Basketball Championships will take place April 12–14 at Wichita State University.